Barnes & Noble said it is exploring a spinoff of its Nook e-reader unit so it can continue to scale the business. In a statement, Barnes & Noble said that it is looking to “unlock” the value of the Nook unit. That’s shorthand to acknowledge that the brick and mortar retail unit overshadows Barnes & Noble’s digital content business. The move may also mean that Barnes & Noble doesn’t have the resources to scale the Nook business. Indeed, Barnes & Noble cut its sales forecast for fiscal 2012, which ends April 30. The company projected fiscal 2012 revenue of $7 billion and $7.2 billion. Wall Street was expecting $7.33 billion. The company will also lose $1.40 to $1.10 a share for the year. Barnes & Noble said sales of the Nook Simple Touch and investments in the Nook business led to the losses. Wall Street was expecting a loss of 63 cents a share. 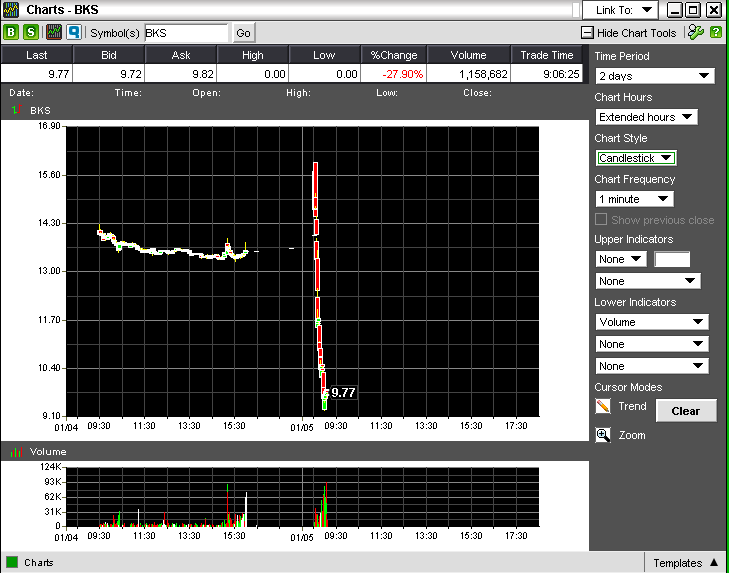 Barnes & Noble shares were crushed in early trading. In Nook, we've established one of the world's best retail platforms for the sale of digital copyright content. We have a large and growing installed base of millions of satisfied customers buying digital content from us, and we have a NOOK business that's growing rapidly year-over-year and should be approximately $1.5 billion in comparable sales this fiscal year. Between continued projected growth in the U.S., and the opportunity for Nook internationally in the next 12 months, we expect the business to continue to scale rapidly for the foreseeable future. There are no guarantees that the Nook unit will be spun off. The company said it is looking into international expansion with partners. Barnes & Noble also provided some sales data, but actual unit data wasn’t given. Barnes & Noble said Nook unit sales were up 70 percent from a year ago. Nook Tablet sales exceeded expectations and Nook Simple Touch lagged. Digital content sales were up 113 percent from a year ago. Nook sales were driven by third party retailers. For fiscal 2012, Barnes & Noble projected digital content sales of $450 million. By the end of 2012, digital content sales will be at a run rate of $700 million to $750 million. It remains to be seen how far the Nook franchise can go as an independent entity. For now the unit is overshadowed. Barnes & Noble’s nine-week holiday retail sales were up 2.5 percent from a year ago to $1.2 billion. BN.com sales were up 43 percent to $327 million for the same period.